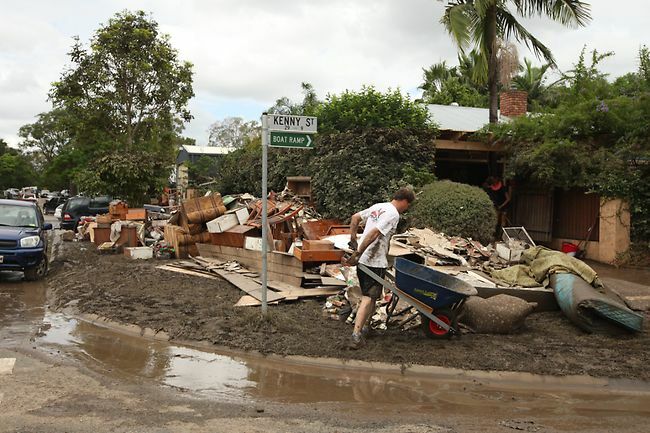 In January this year, my home town of Brisbane was largely flattened by a massive river flood. Water, mud, debris and pollutants filled the streets, houses, offices and cars. But most of all, it swallowed people’s livelihoods, their hard work and the things that they cherished. 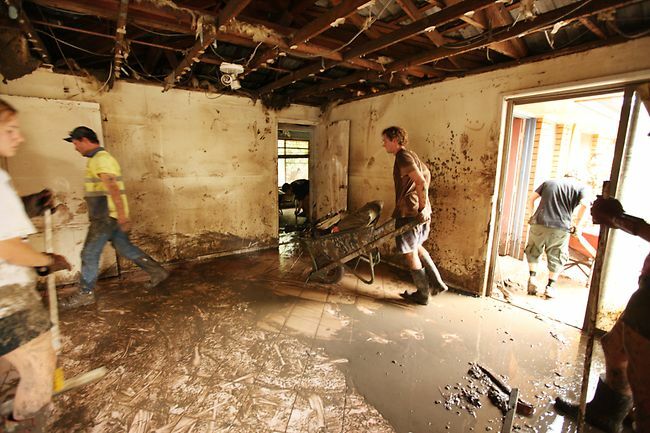 As we literally shovelled wheelbarrow after wheelbarrow of mud from people’s living rooms and bedrooms, the receding water left a painful reminder of what they had lost. People rushed from their homes, packing up what they could save and moved to higher ground. For hours and days, people wept, laughed and sighed as they tried to estimate the damage and loss they would suffer. People leaned heavily on family and friends, watching helplessly, anxiously. Having the time to consider their losses was possibly more traumatic than the loss itself. At least once they saw what they had lost, the grief and healing could begin. My friends and I bundled up our 4WD ute and packed it high with brooms, generators, pressure washers, tools, gumboots, shovels and food. We literally drove from street to street, house to house, in search of anyone who needed help. Some people would be weeping in their front yard at the loss of their garage; others laughing maniacally as the water receded over the roof of their two storey house. None of it made any sense. We would drive down a street, one side looking normal and business-as-usual; the other side brown, broken and destroyed. Everyone had their own way of responding. Some people sat in their front yards with their heads buried in their hands; others rolled up their sleeves and in tears, were ripping out their walls and dumping their worldly possessions into the street. Others laughed and joked around as if to subdue the pain that would come later. I recall entering one man’s house with my friends. After we rolled up in the A-Team Truck (as we nicknamed it) with our equipment, man-power and willingness to help, we didn’t even ask him how we could help, we just started work. When we entered the house, we all took a deep breath. The man had been away the weekend of the flood and didn’t have the chance to remove a thing. The ceiling was collapsed on the floor, there was food in the fridge, dvds in the tv cabinet and the ghostly feeling of what was a normal household just a few days before. He looked at us with tears in his eyes and a quiet demeanour. He didn’t have anything else to say but “thank you.” I’ll never forget that as long as I live. Five hours later and between forty other strangers, we had removed everything from his house including the sheeting from the walls, the entire kitchen, floor coverings, insulation laundry and bathroom, his appliances, photos, furniture and everything he had worked for. His life was piled in the street awaiting a bulldozer to lift it into a dump truck. As we went to say goodbye and continue on our journey to help his neighbour, he stopped and hugged us all. He was so appreciative that some strangers had come to help him pull his world to pieces and carry his muddied life out the door. We looked back into his house and all that remained of his dream was four walls, a roof and a concrete slab. The boys and I jumped back in the car very quietly. We possibly just had one of the most valuable and emotional lessons of our lives. For the next week, all of us shut down our businesses and jobs to spend our mornings, noons and nights helping anyone in need. From the local church to a friend’s business to a stranger’s home we made deep friendships and strong opinions about the importance of camaraderie, generosity and humanity. We all questioned why we attach so much emotional meaning to ‘things’ in our lives and we all agreed that people mattered more. As curious sightseers drove past in their shiny cars, taking photos with lattes in hand, the crowd became angry and started throwing mud and abuse at those who demonstrated such limited compassion and willingness to contribute to the cause. I remember that we entered a neighbourhood near the local university and there was literally a thousand volunteers with gumboots, gloves, hats, shovels and brooms in hand. Local restaurants were driving around offering free food and drinks to anyone at all who was hungry or thirsty. Companies donated needed supplies, trucking companies donated the use of their fleet of vehicles and it’s probably the one and only time in my life I’ll ever be offered a hot indian butter chicken for free from a mud covered van. One scene that will remain with me forever was two girls wearing full burkhas, covered in mud, shovelling in the hot sun with two very ‘Aussie’ guys; ones who could be mistaken for mis-understanding cultural diversity. Australia can be racially intolerant at the best of times and yet to see not one moment of racial intolerance, proved to me that people could prioritise their opinions when it counted. Not all my friends helped out that week, citing reasons of their own. At the time I was angry with them because they epitomised the self-centred identity we value so dearly today. Unless they were directly affected or there was a pay-off, they couldn’t see the point in helping. I learned to let go of that anger but it reminded me that not everyone manages their emotions in the same way nor will it be the people you’d expect to be there when it matters. When you see a flood or another natural disaster on the television, it’s so easy to look shocked and then change the channel. It’s quite a different experience when it’s happening to you, your friends and in your world. I’m not happy that disaster came to my home town; or any town for that matter. But it served a valuable purpose for everyone that month. The people of Brisbane in the following months took more time for each other, people calmed their individualistic temperaments; patience, courtesy and consideration took its place. It changed my view on the ‘things’ I had in my life; the effort and meaning I attached to them and yet how easily they could be taken away. I also learned the importance of the people in the world. We need each other, more than ever. Without me, without my friends, without those strangers we met, that man would have been alone. For at least a week, it wasn’t about ‘you and me’ but about ‘us’. We were united in identity and purpose. It turns out that working so selflessly for others is what nourished the souls of a million people that week. How quickly we forget what it’s like to be human. A very good article pointing out valuable insights on life. Thank you very much. Thanks for your reply – it’s really appreciated. I’m glad you enjoyed it so much! Pauly, it was a challenging time for all involved but every day I thank my lucky stars for people like you who helped during my time of need. I echo the sentiments of your blog and add one thing… Brisbane proved that in times of trouble, human nature is to pull together as a family. That is one of the most comforting things I’ve ever experienced. It sounds farfetched but looking back, I’m genuinely glad my house flooded. It gave me the chance to feel connected to the South-East Queensland community in a way I have never felt before. I have fond memories of the clean-up too: roundhouse-kicking wet walls in bright red gumboots, sharing lunch donated by the local Muslim community group, and of my friends and family trekking in from all over to support me, not expecting any thanks. Great blog post, Pauly. It reminds me how peaceful and warm I felt surrounded by people who cared. And we will *always* have those memories.